Battle of Fei River (383) - The Battle of Fei River, also known as Feishui, is one of the most important battles in China's history. While the Jin Dynasty was the established power in China, to the north, a new empire, the "Former Qin" (to distinguish it from the "Later Qin"), was growing and challenged the Jin. This rising state was led by a man named Fú Jiān, who was the nephew of its founder, also Fú Jiàn. Between 370 and 381, he conquered kingdom after kingdom until all of northern China was under his control, and his empire was now larger than even the Jin. He was said to be a driven, ambitious man who was determined to defeat the Jin Dynasty and rule all of China. By 381, Fú Jiān raised a massive force and prepared for an invasion of the Jin to the south. In August 383 he dispatched his brother, Fú Rong, along with an army of (reportedly) 300,000 men. Later that same month, he also invaded with an army reported to be twice that size. They both won a number of initial skirmishes in the north before penetrating deep into Jin territory and meeting up. The Jin for its part was able to muster an army of only 100,000, which was commanded by a man named Huan Chong. They met at Fei River, with the Former Qin arrayed on the west bank and the Jin on the east. The obvious difference was the numerical superiority of the Former Qin over the Jin. However, the Qin's army was made up of soldiers from conquered states compelled to fight for their conquerors. In addition, they were considered poorly trained and undisciplined. But Fú Jiān was confident of victory, counting on his army to overwhelm the Jin. The account is written in the Zizhi Tongjian, an historical record from the Song Dynasty. It says that Huan Chong sent a messenger to Fú Jiān requesting that his army retreat slightly from the bank so the Jin army could safely cross allowing for the two sides to engage in honorable combat. 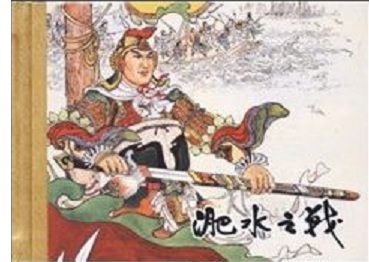 Fú Jiān agreed, but after the messenger returned, he ordered Fú Rong and the other officers to attack halfway through the crossing, thereby cutting the Jin army in half. However, something remarkable happened in the process. The lack of experience and discipline within the Qin ranks would be their undoing; and in this case, their numbers would prove a liability. There were just too many to inform the vast majority to perform a controlled retreat. And when the order came, confusion resulted. The soldiers further from the river bank saw their comrades moving away from what they thought was the battlefield. Not knowing it was a retreat by design, they assumed something had gone wrong and the retreat was genuine. Confusion turned to panic and chaos reigned. The Jin army saw what was going on and hurried across the river as quickly as they could. Fú Rong, the brother, tried to gain control of the situation by heading off the retreat, and preparing the men for attack. But he was cut down and killed by the Jin before that could happen. The Qin soldiers were falling all over themselves and became easy targets for the enemy. The Jin won one of the most lopsided victories in the history of warfare and preserved their kingdom.